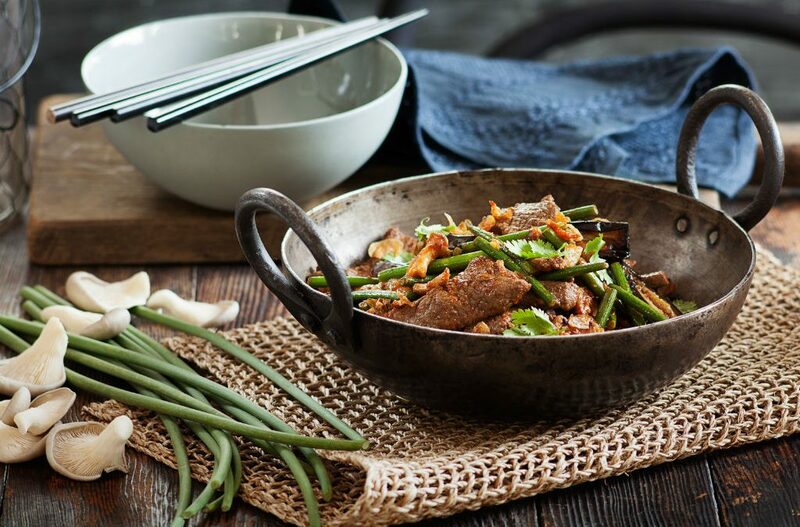 This recipe for beef stir fry with garlic shoots, eggplant and mushrooms is a quick and easy fix for a week night that incorporates meat and veggies and lots of flavour. Combine beef, ground coriander, chilli powder, fish sauce and palm sugar in a bowl and mix well. Leave to marinate for 30 mins. Bring a large wok to high heat, add half the oil and the beef and stir fry for 1-2 minutes until just cooked. Remove from wok and set aside. Add remaining oil and eggplant and fry for 2-3 minutes until golden. Remove and set aside. Drain all but 2 tbsp oil from the wok and return to high heat. Add garlic shoots and stir fry for 1 minute. Add mushrooms and continue to cook for a further 1–2 minutes until vegetables are tender. Reduce heat to low, return beef and eggplant to the wok with the chilli jam, shallots and 1 tbsp water. Toss gently for 1-2 minutes until heated through. Remove from heat and toss through coriander. Serve garnished with extra shallots.